Attribute are used to create a style matrix. Depending on your business model you can create as many style matrix as needed. Attribute works in conjunction with Styles. A style is a grouping of items that have virtually the same characteristics but differ by their attributes. For example, a shirt can come in different sizes and colors, in this example, color and size are the attributes. 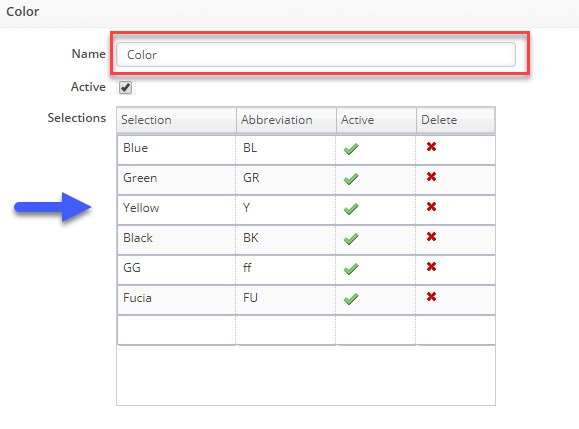 Within each attribute are "Attribute Selections", here you would list all potential variations in color or size. To access the Attribute settings, click on the Gear icon in the upper right corner of the screen. Under the General section, click on Profile Lists. On the Profile Lists, under the General section click on Attribute. Enter a unique Name for the attribute, select if the Attribute is Active, then add your attribute selections by clicking on an open line of the grid in the 'Selection' column. Enter a unique name and abbreviation (within the attribute). Repeat until all your attributes and selections are entered. You can add an unlimited number of attributes and selections. Remember, when you are setting up an attribute ensure to add all the possible Selections for that specific Attribute. If your Attribute is Color enter all the possible colors that you will be selling. This will ensure that when you are creating a Style for your item it will have all the possible Selections used for the item. If you are no longer using an attribute, uncheck the Active box. You can also delete a selection by clicking the 'x' icon.